Jessica Vaughan is the director of policy studies at the Center for Immigration Studies; Preston Huennekens provided research assistance. Every year, about one million new legal immigrants, or lawful permanent residents, are admitted to the United States. More than 10.6 million immigrants were admitted from 2007 through 2016. According to DHS statistics, in recent years about half of these immigrants have been what are sometimes called "initiating immigrants", or the first in their family to settle permanently in the United States, perhaps after attending college, finding employment, as refugees from persecution, or receiving amnesty after illegal settlement. The other half are not path-breakers, but are joining family members who arrived earlier, in the phenomenon known as chain migration. 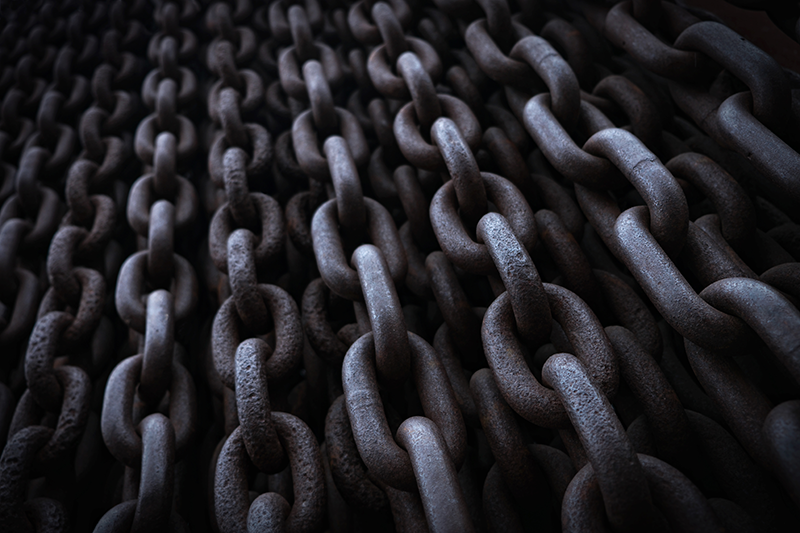 This report examines the scale of chain migration and recent trends of family sponsorship over time and across different groups of immigrants. In addition, we examine how an amnesty for beneficiaries of the Deferred Action for Childhood Arrivals (DACA) program is likely to increase chain migration in the future, as DACA beneficiaries eventually qualify for citizenship and the opportunity to sponsor their parents and siblings, many of whom also have been residing in the United States illegally. Approximately 1.2 million legal immigrants were approved for admission in 2016, which is about 13 percent higher than 2015, and one of the highest numbers in the last decade. Congress could mitigate the chain migration impact of a DACA amnesty by eliminating and/or scaling back the three main categories of chain migration (parents, adult sons and daughters, and siblings of citizens). If the controversial visa lottery program also were eliminated, legal immigration would be reduced by 20 percent. It is not easy to determine the scale of chain migration from the annual statistics published by the Department of Homeland Security, which presents the figures according to the categories of the law that provided for the admission of the immigrant. Some of these categories, like the employment categories, the visa lottery, and most humanitarian admissions, are clearly new arrivals, or what some scholars have called "initiating immigrants". Some categories are entirely chain migration, such as the categories for parents, siblings, sons and daughters of U.S. citizens, and spouses of permanent residents. One of the largest single categories of family immigration is spouses of U.S. citizens. These individuals can be either chain migrants or initiating immigrants, as their sponsors can be native-born citizens or naturalized immigrants. 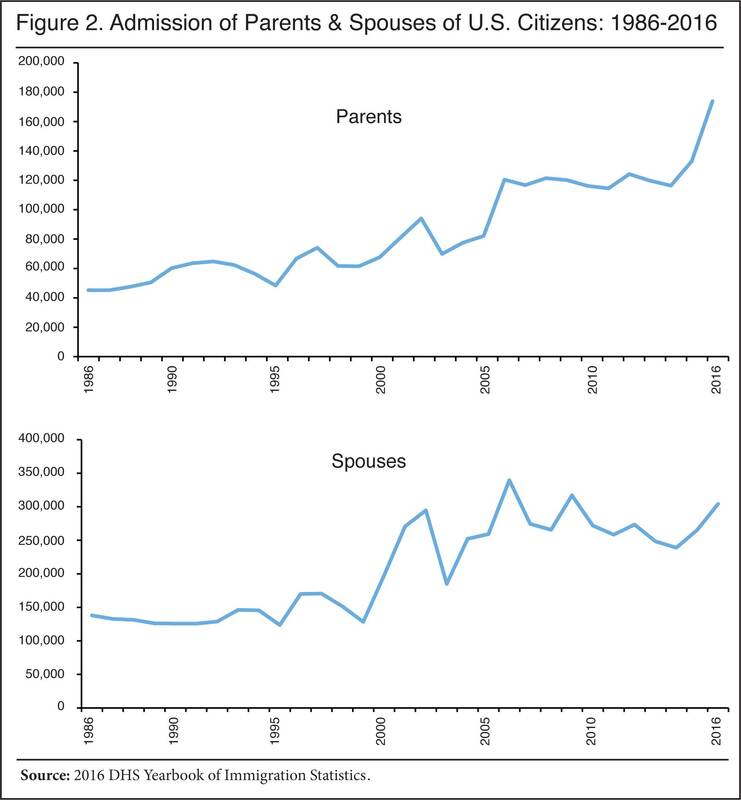 For the purpose of estimating chain migration, other scholars have used Census Bureau data on the spouses of foreign–born married individuals in the general U.S. population. This yields an assumption that approximately half of the immigration sponsors of spouses are foreign-born and half are native-born.1 We use this methodology in our estimates in this report. 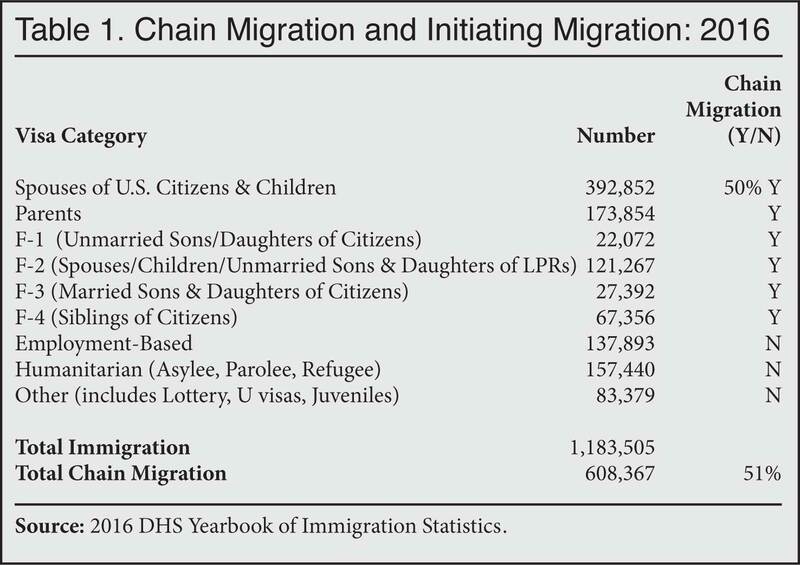 Table 1 shows the breakdown of initiating and chain migration in 2016, the most recent year for which detailed statistics are available. Another complicating factor in measuring the effects of chain migration is the lag time that occurs before initiating immigrants sponsor family members. Initiating immigrants can sponsor spouses and children as soon as they have permanent residency, but they cannot sponsor parents or siblings from abroad until they become U.S. citizens. Some immigrants never become citizens, and some wait for years after they are eligible to naturalize. Further, some categories of chain migration have numerical limits. Because worldwide demand for immigrant visas far exceeds these limits, there are long waiting lists in these categories. As of November 2017, there were about four million people who had been sponsored by a relative in the United States who were on the waiting list for family-based immigrant visas.2 All of these are chain migration applicants. They face waiting periods of 22 months to 23 years, depending on the category and the country of origin. This slows down the process of chain migration. Scholars have been trying to measure chain migration at least since the 1980s. The earliest studies were done through interviews and surveys, often concentrating on specific ethnic groups, and came up with estimates for chain migration multipliers ranging from 0.5 to 18 sponsored chain migration immigrants per new immigrant. More recent and more comprehensive studies of chain migration have been conducted by Princeton University researchers Stacie Carr and Marta Tienda. Their findings were published in 2013 in a series of papers.3 Rather than surveys, Carr and Tienda used administrative data from federal immigration agencies on cohorts of all immigrants who were admitted between 1981 and 2009. They built on and refined the findings of an earlier study by Brown University PhD candidate Bin Yu, which used administrative immigration data from 1972 to 1997 and Census Bureau data.4 Carr and Tienda updated Yu's findings and added data on aliens legalized in the 1986 amnesty. Using administrative data over an extended time period helps account for the lag time in sponsoring family chain immigrants that is caused by delays in naturalization and the waiting lists. Carr and Tienda classified all the immigrants who arrived between 1981 and 2009 as either "initiating immigrants" or "family unification immigrants". The initiating immigrants were in the following categories: employment-based, government-sponsored (visa lottery, humanitarian, or amnesty beneficiaries), and spouses of native-born citizens. The family unification immigrants were admitted in all of the other family categories; i.e. dependents of new immigrants, spouses of naturalized citizens and legal permanent residents, and parents and other extended family members of citizens — in other words, chain migration immigrants. 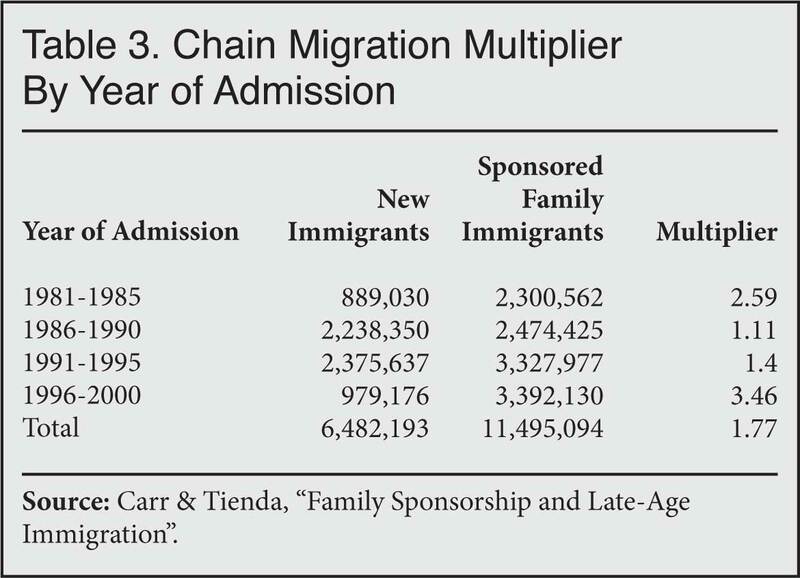 To determine the share of immigration from 1981 to the present that came from chain migration, we compared Carr and Tienda's calculations on family unification immigration to the total level of immigration for the same period. In addition, we updated Carr and Tienda's figures with newer administrative data from 2009 to 2016. We found that over this 35-year period chain migration has always been a major share of total immigration, and averages out to about 60 percent of total immigration. Out of a total of nearly 33 million immigrants admitted between 1981 and 2016, more than 20 million were chain migration immigrants (61 percent). One of the lowest periods of chain migration was following the 1986 amnesty, when more than half of total legal immigration was comprised of former illegal aliens who received green cards. Those who were legalized were not able to sponsor family members from abroad until several years after their legalization, following a period of temporary legal residency and then processing for a green card. The relatives sponsored by these legalized aliens did not begin making up a large share of the chain migration until the 1990s and beyond. As discussed below, this pattern likely would not hold true after a DACA amnesty. Immigration scholars have long sought to determine the true scale and nature of chain migration, including its multiplier effect on later immigration. To answer this question, Carr and Tienda produced detailed estimates of chain migration multipliers for five-year cohorts of new immigrants. They found that immigrants who arrived between 1981 and 2000 each sponsored an average of 1.77 additional immigrants. Their findings varied greatly according to the years in which the immigrants arrived. The period 1986-1995 had much lower future sponsorship rates than the 1981-85 and 1996-2000 cohorts. 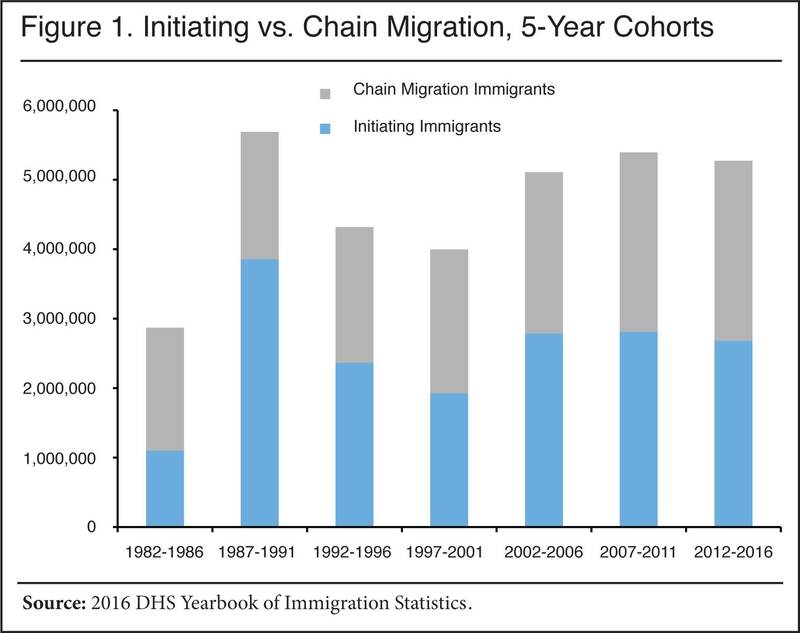 There are several reasons why the chain migration rates of the 1986-95 cohort seem to skew low. First, as discussed above, most immigrants in those years were aliens legalized under the 1986 amnesty. Under the terms of that amnesty, they were first granted 18 months of provisional legal status, after which they were eligible to apply for a green card, at which point they could sponsor family members. In addition, it turned out that the amnestied immigrants were less likely to naturalize, or naturalized much later than other immigrants.5 This means that they were less likely to use the extended family immigration categories (such as parents and siblings), or if they did, because of the long waiting lists, the sponsored family members arrived after 2000 and thus were not counted in Carr and Tienda's study. The chain migration multiplier for the more recent cohorts of immigrants is much higher than historical norms. Immigrants who arrived in the 1996-2000 cohort sponsored an average of 3.46 additional family members for admission, more than double the rate for immigrants who were admitted in the previous 10 years, and even higher than those who came in the pre-IRCA period. 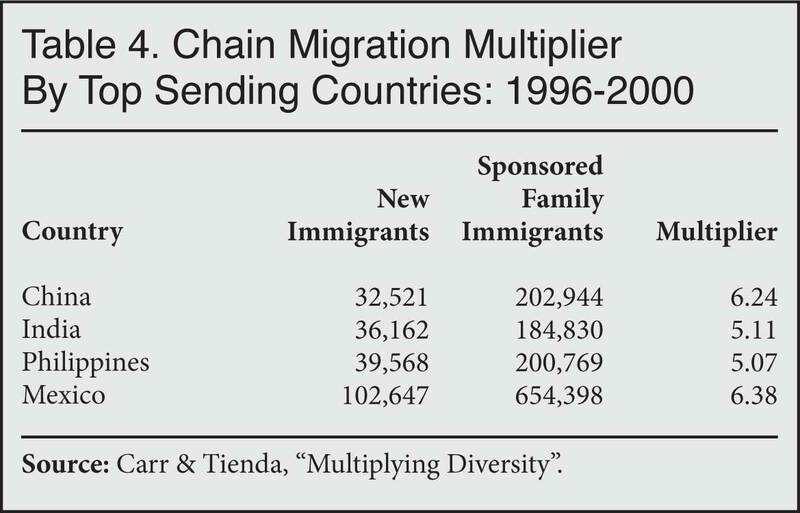 Chain migration rates varied greatly according to the country of origin of the immigrants, according to Carr and Tienda. When they examined sponsorship rates by region of the world, they found that immigrants from the Western hemisphere had the highest rates of chain migration and immigrants from Europe and Africa had the lowest rates. Of the four main countries of citizenship of immigrants, in recent years those from China and Mexico have had the highest chain migration rates (see Table 4). One interesting trend in legal immigration that was detected by Carr and Tienda is that the average age of immigrants has risen gradually, but significantly, over the last three decades. They attribute this to the effects of chain migration, especially the sponsorship of parents. The researchers found that the number of "late-age" immigrants, defined as those over age 50, has increased since the 1980s. At that time, about 17 percent of family migrants sponsored were 50 or over. In contrast, about 21 percent of the family members sponsored by those who arrived in the late 1990s were age 50 or older — a rate that is more than 24 percent higher, and comes at a time when the total inflow of new immigration was higher. This means that since the 1990s a larger share of a larger pool of new immigrants has been over age 50. These older chain migration immigrants were found mainly in three categories: parents, adult sons and daughters, and siblings of U.S. citizens. More than 90 percent of the parents sponsored as family immigrants and about 20 percent of the extended family immigrants sponsored by immigrants who arrived in the latest cohort were over age 50. While the dependency rates and costs of health care and other social services to older immigrants is beyond the scope of this report, at a minimum it is fair to say that these issues were much less of a fiscal concern when the immigration system was created in 1965, and that new realities — such as a changing labor market and a changing health care system — demand a review of whether a growing inflow of older immigrants is either sustainable or helpful to our country. The recent termination of the DACA program, which gave work permits to illegal aliens who arrived before the age of 16 and who had lived in the United States continuously at least since June 2007, has triggered Congress to once again consider proposals for a large-scale amnesty. The number of current DACA beneficiaries is approximately 690,000. Like other amnesties before it, a DACA amnesty inevitably would create a new surge of chain migration. This is because the vast majority of the DACA beneficiaries originally arrived with their parents, and these parents plus any siblings typically are still living in the United States illegally. It is reasonable to assume that the DACA amnesty grantees would seek to sponsor their parents and non-citizen siblings at the earliest opportunity — which would be as soon as they obtain citizenship, under current rules. If there are no other changes to the immigration system, according to the models described above, an amnesty for DACA recipients potentially could add at least 700,000 and quite likely well over a million new family-based immigrants. The admissions would begin as soon as two years after the DACA beneficiaries receive green cards (in the case of spouses) and continue for another 20 years or more (in the case of siblings). The total number of chain immigrants depends on the number of family members that DACA members have, both in the United States and abroad; how quickly the DACA beneficiaries become citizens; and how quickly their sponsored spouses and parents become citizens. The greatest multiplier effect will come as the DACA amnesty beneficiaries sponsor their parents. Under current rules, DACA amnesty beneficiaries will be able to petition for non-citizen spouses and their children right away. An analysis of Census data by the Center for Migration Studies found that, in 2014, 5 percent of the original DACA-eligible population were married to non-U.S. citizen, non-legal immigrants (most likely illegal aliens).6 By today's DACA numbers, that would be about 34,500 non-legal spouses. However, there are a number of hurdles to obtaining green cards for the illegal alien spouses (and their children) of DACA amnesty beneficiaries. First, the category for these applicants is numerically limited, and the current waiting time is about two years after the petition is filed; those being admitted now in this category applied in the fall of 2015.7 These waiting times could increase somewhat if there were a large volume of applicants in this category, which has an annual limit of about 88,000. The second hurdle is that by law an alien who has been present in the United States unlawfully as an adult for more than six months and then departs is subject to bar on re-entry of either three or 10 years, depending on the length of illegal presence (INA Section 212(a)(9)(B)). If a DACA beneficiary is sponsoring an illegal alien spouse for a green card, then in some cases that illegal alien must depart from the country to apply for the green card in their home country, which makes them subject to the re-entry bar. This requirement applies to those illegal aliens who were illegal border-crossers, but not to visa overstayers. There is a waiver available in certain circumstances, but these are not routinely approved (and should not be) because they require that a sponsor demonstrate that there would be extreme hardship to a U.S. citizen, perhaps a child, if the spouse is not permitted to stay in the country. In the majority of these cases, the illegal alien spouses usually choose to take their chances by staying in the country illegally while waiting for the sponsor to become a citizen (and beg or demand for prosecutorial discretion if caught) rather than move with their spouse to their home country to wait out the bar. Given these hurdles, it is unlikely that there will be a very large number of illegal aliens who obtain green cards through marriage to a DACA beneficiary. If we assume that the percentage of illegally present DACA spouses who overstayed visas (as opposed to illegal border crossers) is proportionate to the total population of overstayers, then it is likely that about 13,800 illegal alien spouses of DACA beneficiaries would be able to obtain green cards, along with an unknown number of the spouses' illegally resident children (34,500 * 40 percent). This would occur two to three years after the amnesty, at the earliest. Upon receiving green cards, these spouses can then begin to sponsor their family members. Parents and siblings are another story. It is widely assumed that most individuals with DACA came to the United States with one or both parents and possibly siblings, and that these parents and siblings are also in the country illegally (some of the siblings might also have qualified for DACA). If DACA beneficiaries are awarded green cards under an amnesty program, then under the current system, if they become citizens they will be able to sponsor their parents and siblings for green cards. Under current law, after five years of lawful residency they will be able to apply for naturalization. To qualify for citizenship, an applicant must demonstrate good moral character, English proficiency, and pass a basic civics test. Unlike spouses of green card holders, the parents of DACA beneficiaries would face no waiting lists, because under current law the parents of citizens are admitted in unlimited numbers. Even without a waiting list, it is possible that the processing time would lengthen somewhat, as USCIS would experience a higher volume of naturalization and subsequent petitions for parents beginning five years after the amnesty, but this would not necessarily be the case if the agency plans ahead. The illegal alien parents who arrived on visas (or with visa waivers) and overstayed would be able to adjust status as soon as their applications are processed. Similarly, any parents who remained abroad would be able to enter as soon as their applications are processed. Theoretically, the illegally present parents who crossed the border illegally would not be eligible to complete their green card application within the country and would have to depart, subjecting them to the three/10-year bar on admission. Some would qualify for waivers to the bar based on a demonstration of extreme hardship to a citizen, but presumably these would be relatively small in number. An equally plausible scenario is that many of the parents would return to their home country, most likely Mexico, to apply for an immigrant visa and simply claim that they had never been or had not remained in the United States illegally long enough to trigger the re-entry bar. If an alien has never been encountered by a federal agency, there would be no record of the alien's presence that the consular officer could easily access. Under current procedures, as a practical matter it would be difficult for a consular officer to disprove the alien's claim and to articulate sufficient grounds to refuse the immigrant visa. Unless consular officers are provided with better vetting tools, perhaps including access to state driver's license databases, tax records, and other sources commonly used in the private sector, and encouraged to apply the law strictly, with such high stakes for the alien and such huge workloads for the consular officers, it is likely that many applicants will attempt this type of misrepresentation, and many will succeed. For all of the reasons stated above, it is realistic to conclude that most of the parents of the DACA beneficiaries would be able to obtain green cards soon after their sons or daughters become citizens. If 700,000 DACA beneficiaries obtain citizenship and sponsor one parent each, that would be an additional 700,000 chain immigrants beginning five years after the amnesty. Some of the DACA beneficiaries might become citizens three years after the amnesty if they marry U.S. citizens. Others might choose not to naturalize at all. What is clear is that having parents in the country illegally would be a powerful motivation to become citizens. In addition, the sponsored parents would be able to sponsor other members of their families when they receive green cards and citizenship, continuing the chain. The illegally present siblings of naturalized DACA beneficiaries also could be sponsored for green cards. Under the current system, they would face an extended waiting list, likely 20 years or more, depending on their country of citizenship. In addition, they would be subject to the bar on admission after illegal presence, but potentially could find the same ways to get around it as the parents. There is some chance that Congress will make changes to the legal immigration system in an attempt to mitigate the inevitable chain migration effects of a DACA amnesty. The leading proposal is the Reforming American Immigration for Strong Employment (RAISE) Act, which was introduced by Sens. Tom Cotton (R-Ark.) and David Perdue (R-Ga.) in February 2017. This bill has been endorsed by President Trump and a companion bill was introduced in the House by Rep. Lamar Smith (R-Texas). Among other provisions, the RAISE Act would eliminate the green card categories for siblings and adult sons and daughters of citizens. It would also replace the green card benefit for parents of citizens with a five-year renewable residency visa without work authorization. It replaces the current employment-based categories with a merit-based admission category. If the RAISE Act becomes law, it would reduce the chain migration impact of a DACA amnesty. The siblings of DACA amnesty beneficiaries would no longer qualify for green cards based on their family relationship, but some might qualify under the merit category, particularly any who have attended college here. The admission of the DACA parents would not likely be affected in a significant way. Presumably these parents would be able to qualify for the long-term residency visas as easily as they qualify for green cards under the present system. They will not be able to work legally, but that is unlikely to be a deterrent to their application. Many are working here illegally already and probably would continue doing so. Others are at or approaching retirement age and might drop out of the workforce. However, under the RAISE Act provisions, the sponsored parents would not be able to sponsor additional family members, as they would not have green cards or a path to citizenship, except through the merit category. Unlike earlier times in our history, when immigration ebbed and flowed in distinct waves, the last several decades have been a time of constantly increasing immigration. Our immigration system allows this growth both through family chain migration and by expanding the number of initiating immigrants through amnesties, humanitarian admissions, employment visas, and the visa lottery, all of which set off new chains of family migration. If Congress enacts an amnesty offering permanent residency to 700,000 DACA recipients and there are no other changes to our legal immigration system, that amnesty will result in a surge of potentially double that number of chain migration immigrants. The most effective way to mitigate this surge in chain migration is to eliminate entire categories of immigrant visas and green cards that are now reserved for the extended family members of prior immigrants (siblings and adult sons and daughters), and thus facilitate chain migration. Admissions in these two categories amount to about 85,000 per year, or about 8.5 percent of legal immigration. In addition, Congress should eliminate the visa lottery, which admits about 50,000 per year. Together, these reforms would reduce immigration by 135,000 per year, or just over 13 percent. Cutting these categories at the same time would reduce the multiplier effect of admitting new immigrants, as fewer family members would qualify to follow. Limiting the admission of parents would further dampen chain migration. Between 110,000 and 125,000 new immigrants are admitted in the parents category each year — which is nearly equal to the number who come in the extended family categories. Since the oldest immigrants come in the parents category, establishing numerical limits would alleviate some of the fiscal costs associated with immigration. Replacing these green cards with long-term residency visas, as under the RAISE Act, also would help reduce chain migration in the long term, as the parents no longer could sponsor their other children or their siblings, but it is not likely to reduce the number of parents who are sponsored by naturalized citizens in the first place. If the number of parent admissions instead were limited to 65,000 per year, and the other chain migration categories were eliminated as suggested above, then total legal immigration would be reduced by 200,000 per year, or 20 percent. 1 Stacie Carr and Marta Tienda, "Family Sponsorship and Late-Age Immigration in Aging America: Revised and Expanded Estimates of Chained Migration", Princeton University, August 2013. 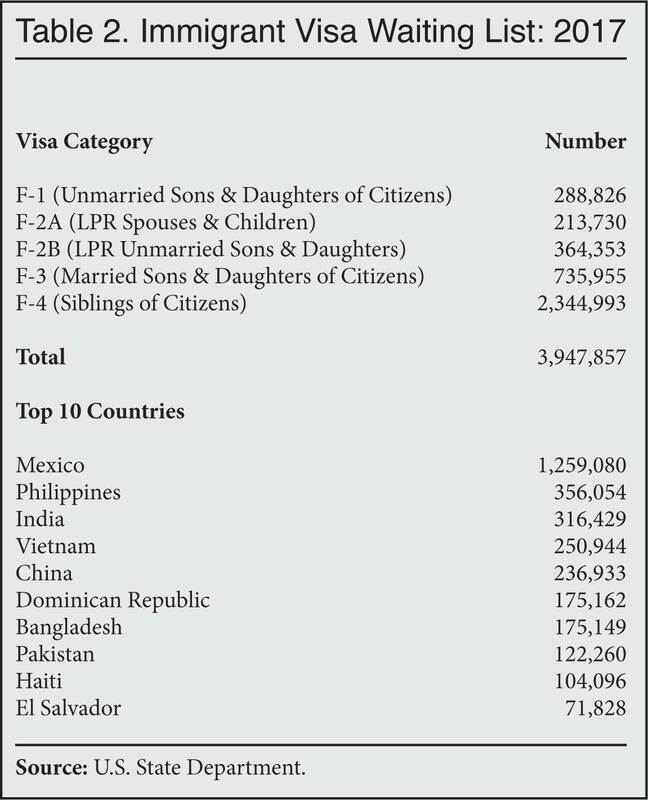 2 "Annual Report of Immigrant Visa Applicants in the Family-Sponsored and Employment-Based Preferences Registered at the National Visa Center as of November 1, 2016", U.S. State Department. 3 These include Stacie Carr and Marta Tienda, "Multiplying Diversity: Family Unification and the Regional Origins of Late-Age Immigrants, 1981-2009", Princeton University, March, 2013; and Carr and Tienda, "Family Sponsorship and Late-Age Immigration", op. cit. 4 Bin Yu, "Immigration Multiplier: A New Method of Measuring the Immigration Process", Brown University, 2005. 5 Naturalization rates are strongly correlated to country of origin. The majority of IRCA-legalized immigrants were from Mexico and, for a variety of reasons, immigrants from Mexico have had much lower and slower rates of naturalization than other nationalities. See Paul Taylor et al, "Recent Trends in Naturalization, 2000-2011", Pew Hispanic Center, November 2012. 6 Donald Kerwin and Robert Warren, "Potential Beneficiaries of the Obama Administration's Executive Action Programs Deeply Embedded in US Society", Journal on Migration and Human Security, Vol. 4, No. 1 (2016). The authors estimate that approximately 16 percent of an "expanded-DACA" eligible population is married to a non-citizen, non-LPR. "Expanded-DACA" refers to illegal aliens who arrived by 2010 (three years later than original DACA) and/or who were older than the age 31 cut-off of original DACA. 7 "Visa Bulletin for September 2017", U.S. Department of State, August 9, 2017.